The Buffalo and Erie County Naval & Military Park will convert hangar building into ‘Hall of Honor’ to make room for historic items and memorabilia. 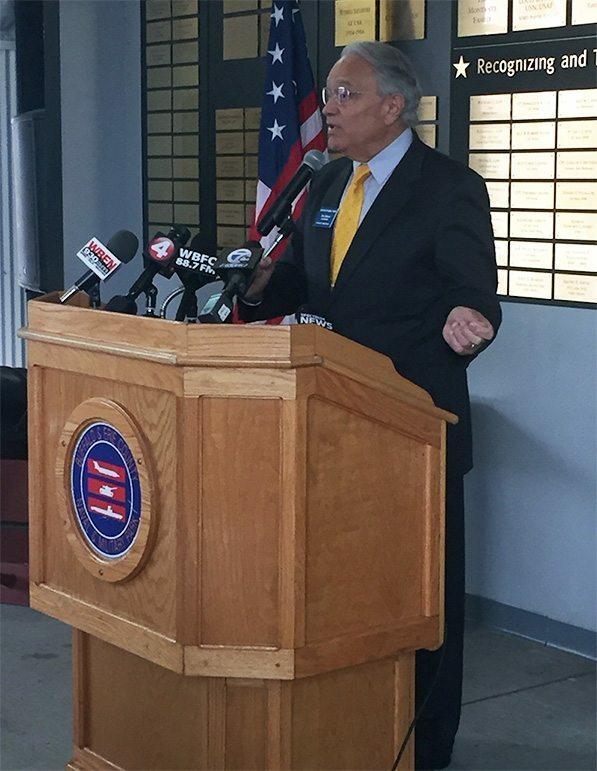 Buffalo, NY– On Friday, October 27th 2017, Assemblyman Kearns announced $250,000 in state funding for the Buffalo & Erie County Naval & Military Park. 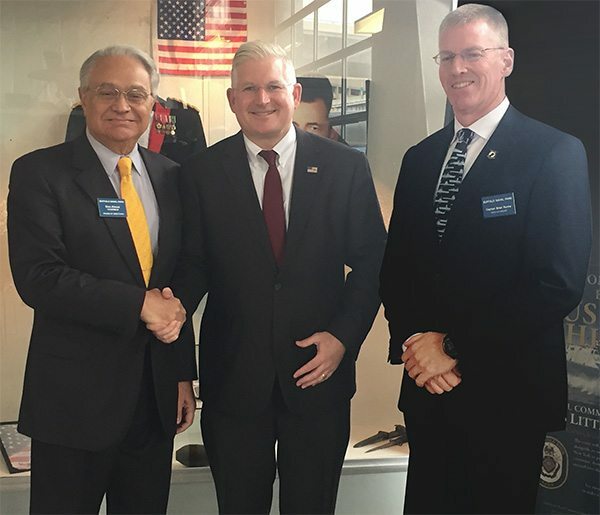 Kearns was joined in the Hangar Building at the Naval & Military Park by the park’s chairman of the Board of Directors Donald A. Alessi, and Executive Director Captain Brian Roche. The money awarded to the Naval & Military Park will be used for renovating, updating and expanding Buffalo’s exceptional Naval and Military Park’s Hall of Honor, formerly The Hangar Building. As popularity of the Buffalo & Erie County Naval & Military Park continues to grow, so has the desire from the public to donate historic items and personal memorabilia to the park. The limited amount of exhibition space for such items has led to the development of a plan to convert the hangar building, currently used mainly for storage and events, into a ‘Hall of Honor” with exhibit space. As of now, the only space readily available to display artifacts and other historical items is on the second floor of the museum’s main building. 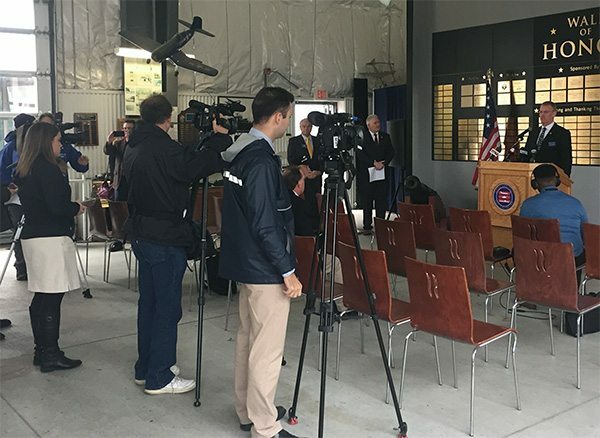 This expansion and renovation of the hangar building into a ‘Hall of Honor’ would provide the Buffalo & Erie County Naval & Military Park the opportunity to take in and showcase a variety of historic exhibits, items and personal memorabilia donated to the Buffalo & Erie County Naval and Military Park and space to expand its educational programs. Support for the project has also come in from the City of Buffalo, which dedicated bond funds of $240,750 in 2016 to develop design plans and construction documents for the ‘Hall of Honor’ expansion. The design process is currently underway, with completed plans expected in 2018. Erie County has also dedicated bond funds of $960,000 in 2016 to implement Phase 1 of construction. Board Chairman Don Alessi thanking Assemblyman Mickey Kearns for the generous $250,000 grant for the Park. The media looking on as Captain Brian Roche welcomes guests to the press conference. (From left to right) Don Alessi, Board Chairman, Assemblymen Mickey Kearns and Capt. Brian Roche. Join us in November for a Toast to the Troops! Throughout November – Veterans Appreciation Month – the Buffalo Naval & Military Park is partnering with several WNY craft breweries and bars — together with 7 Eyewitness News WKBW and Country 106.5 WYRK— in a fundraiser to honor our veterans and support the Naval Park. Simply stop into any of the establishments listed below, donate whatever amount you like, and sign a “Toast to the Troops” card which they’ll post proudly at that location. Then — raise your glass with those around you to salute and give thanks to our veterans for all they’ve done for our country! 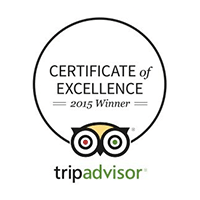 Would you like to see your establishment on this list? There’s no cost to participate! Just call the Naval Park at (716) 847-1773 and ask for Paul. The concept is simple: whenever patrons stop in, we just ask that your servers/bartenders ask them if they’d like to make a Toast to the Troops. And for whatever monetary donation they’d like to give ($1 minimum suggested), they’ll get the attached card, which they can sign and give back to the server, who will then display it on a wall in your bar/restaurant throughout the month. All proceeds benefit the Naval & Military Park. There’s no cost to you to participate, and we only ask that you hang on to the money for us in between our weekly pick-ups. Our support package includes a stack of cards, a sharpie marker, a roll of masking tape and a collection envelope, so hopefully, this will be virtually effortless on your part. In return, we’ll include your establishment’s name on our Naval Park website and in social media posts as a participant with the intention to drive some traffic your way as well. Please share your photos with us on our Facebook page. By the way, Veterans Day is Saturday, November 11, so this could be a nice way for you to gain some extra patrons that day by promoting this on your own web/social media! The future USS Little Rock LCS 9, one of the newest US Navy littoral combat ships (LCS), will make her way to Buffalo for an official Commissioning Ceremony on Saturday, December 16, 2017. A ship commissioning is an event that marks the time when a new ship officially enters the US Navy fleet. LCS 9 and her crew are expected to arrive in Buffalo on Friday, December 8, 2017 for a week-long commissioning celebration. A schedule of events for Commissioning Week (December 8 – December 17) is being finalized and will be released next week. read the full press release on the USS Little Rock Commissioning Committee website. Buffalo, New York – Veterans from around the nation will be coming to Buffalo, October 23–30 for the 2017 National Veterans Creative Arts Festival (NVCAF). This national event is the celebration and grand finale stage and art show of talent competitions representing 51 categories of art, creative writing, dance, drama and music, for Veterans across the nation, treated in the Department of Veterans Affairs (VA) health care system. Over 120 Veterans will exhibit their artwork or perform musical, dance, dramatic or original writing selections in a gala variety show to be held Sunday, October 29 at UB Center for the Arts. The art exhibit and creative writers’ meet and greet takes place from noon–1:45 pm in the Atrium, and the stage show begins at 2 pm on the Mainstage Theatre. A professional orchestra will accompany the performance. VA medical facilities incorporate creative arts into their recreation therapy programs enhancing rehabilitation for both inpatients and outpatients. This annual competition recognizes the progress and recovery made through creative arts therapy, and raises the visibility of the creative achievements of our Nation’s Veterans after disease, disability or life crisis. Two local winners will participate; James Becker’s “Intraflection” stood out in the Military Combat Experience category and David Krieger’s, “They Call Me Jake” in the essay (other) category. Tickets are available by calling 716-862-6814 for this free event open to the public, presented by Department of Veterans Affairs and American Legion Auxiliary.